A 29-year-old man presented to the gastroenterology department, Bülent Ecevit University Hospital, with one week history of continous abdominal pain in the epigastric and right upper quadrant of the abdomen. The pain was unrelated to food consumption, and there was accompanying nausea but no vomiting. His past medical history was uneventful. On physical examination, the patient was alert and oriented. His temperature was 36.7oC, he had a regular pulse which measured 78 beats/min, and his blood pressure was 120/70mmHg. There was epigastric tenderness on deep palpation. There was no guarding and no rebound tenderness. His respiratory and cardiovascular system examinations were normal. Laboratory investigations revealed: C-reactive protein 13.2mg/L (0–8mg/L normal), serum alanine transaminase 378U/L (10–49U/L normal), serum aspartate aminotransferase 405U/L (120–246U/L normal), serum gamma-glutamyl transpeptidase 591U/L (0–73U/L normal), serum lactate dehydrogenase 348U/L (120–246U/L normal), serum alkaline phosphatase 158IU (80–280IU normal), total biluribin 2.0mg/dL (0.3–1.2mg/dL normal), amylase 32U/L (30–118U/L normal), and lipase 24U/L (6–51 U/L normal). The results of a complete blood count, electrolyte panel, and renal function tests were normal. An abdominal ultrasonography showed a well-demarcated anechoic cystic lesion, 75mm in diameter with multiple septations in the left liver lobe. Magnetic resonance imaging and magnetic resonance cholangiopancreatography were also performed [Figure 1 and 2]. What is the diagnosis based on the imaging? 1. 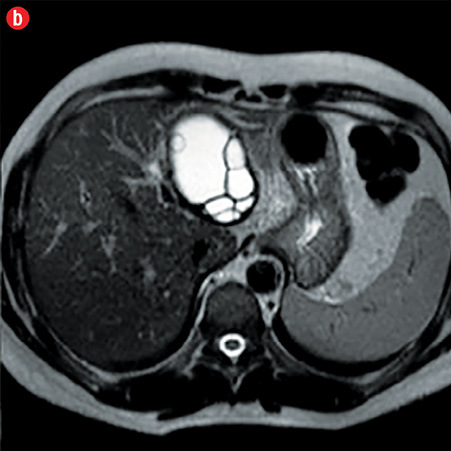 The imaging diagnosis ipoints toward hepatic hydatid cyst with biliary ductal connection. 2. In the presence of biliary connection, the surgey is the best choose for hepatic hydatid cyst treatment. The MRI and MRCP images disclosed a big hydatid lesion appearing as multivesicular cystic lesion in the left liver lobe and minimal dilatation of secondary segmental bile ducts (Figure 1). 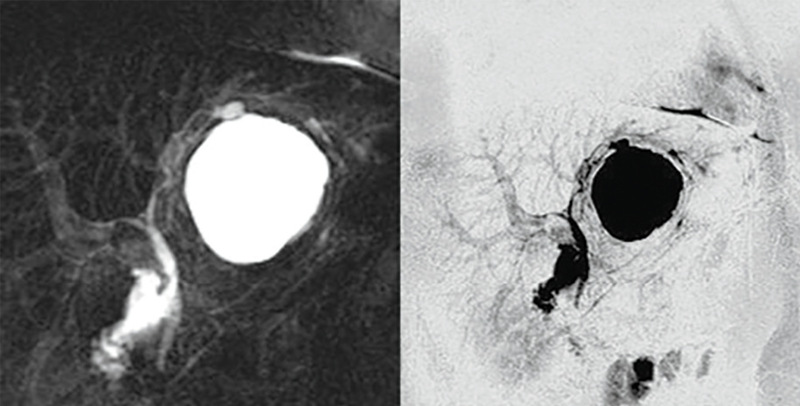 Additionally, there was irregularity and beak-like projection at the dome of the cyst’s wall and a tiny lineer relationship between the peripheral bile duct and cyst wall was noticeable on MRCP imaging (Figure 2). 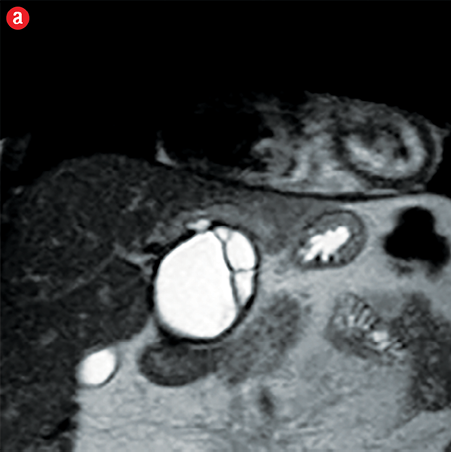 Figure 2: Magnetic resonance cholangiopancreatography revealed cystic lesion and biliary system. According to MR findings, a surgical examination was carried out. Postoperative period was uneventful and he recovered quickly after surgery. Surgical resection of the hydatid cyst was done and during surgical exploration of the wall of the cyst, entry of the bile duct into cystic cavity was seen (Figure 3). After surgical resection, the patient’s abdominal pain subsided and liver functions turned to be normal. The patient was discharged with a prolonged course of albendazole treatment. It was reported that there is biliary connection with the cystic cavity in 80% of the cases.2 The radiologic findings of biliary ductal-cystic connection include visible communication between the cyst and the biliary tree, cyst wall discontinuity that direct sing of rupture but not only for intrabiliary rupture, deformation of a cyst, a focal defect in the pericyst, detachment of the membrane, ductal displacement by extrinsic compression, beak-like projections from the cyst wall, bile duct changes due to cholangitis, dilatation of downstream bile ducts, Intraductal cyst content.3 MR and MRCP give a chance for non-invasive visualization of the biliary anatomy, with a sensitivity of 75-91.7% and specificity of 82.8-95%.3 Previously, biliary ductal-cystic connection could only be demonstrated on endoscopic retrograde cholangiopancreatography (ERCP), but MRCP now offers a noninvasive diagnostic alternative without the risks associated with ERCP. Visulalization of biliary ductal-cystic connection is important for the management of treatment. The percutaneous puncture, aspiration, injection, reaspiration (PAIR) is one of the options but the agents (Hypertonic saline solution, alcohol) that used PAIR have toxic effects on the biliary system and cause the sclerosing cholangitis. In the presence of biliary connection, the appropriate treatment technique of hepatic hydatid cyst is surgery. In conclusion, MR and MRCP are proved to be sensitive and valuable non-invasive diagnostic methode for the diagnosis of intrabiliary rupture or biliary ductal connection of hepatic hydatid disease. Marani SA, Canossi GC, Nicoli FA, Alberti GP, Monni SG, Casolo PM. Hydatid disease: MR imaging study. Radiology 1990 Jun;175(3):701-706. Mendez Montero JV, Arrazola Garcia J, Lopez Lafuente J, Antela Lopez J, Mendez Fernandez R, Saiz Ayala A. Fat-fluid level in hepatic hydatid cyst: a new sign of rupture into the biliary tree? AJR Am J Roentgenol 1996 Jul;167(1):91-94. Erden A, Ormeci N, Fitoz S, Erden I, Tanju S, Genç Y. Intrabiliary rupture of hepatic hydatid cysts: diagnostic accuracy of MR cholangiopancreatography. AJR Am J Roentgenol 2007 Aug;189(2):W84-9.